He might be 90 years old, but that’s not stopping Jacob “Jack” Kaufman from skiing – and he’s not wasting his time on the bunny slopes, either. Kaufman moves fast. Nobody on the hill seems to give him a double-take because not only is he skiing as good as most people, but he doesn’t look like he’s 90, either. Kaufman, who lives in Michigan, is in Vail this week with his family to celebrate his 90th birthday, which was Friday. 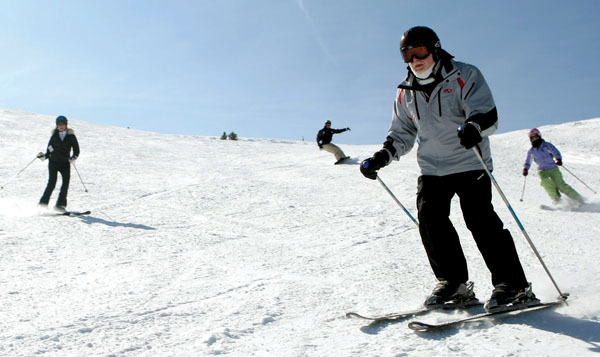 He started skiing regularly in 1955 and it’s become a big part of his life. “I’m dedicating this week to my brother, Don,” Kaufman said. Don Kaufman passed away about 20 years ago, but his memory lives on as strongly as his skiing legacy. Don Kaufman taught his brother how to ski, although his method of teaching was questionable, Jack Kaufman jokes. When he did ski again, the brothers were up to their shenanigans again. Jack Kaufman stood on the back of his brother’s skis and rode down the hill with him. They laughed the whole way down and Jack Kaufman became hooked on the sport. The Kaufman brothers were adventurous and they passed that trait onto their children – that’s how Jack Kaufman ended up in Vail on this trip, with three generations of skiers taking to the slopes for the occasion. Karen McFall, Jack’s daughter, moved out to Vail for the season with her husband, Tom, so they could be ski instructors at Vail. Karen McFall led her family around the Vail slopes all week, amazed that her father was still skiing with her – she never expected they’d still be skiing together at his age. She introduces her father proudly to everyone she meets. She said he’s been such a wonderful role model to the entire family and everyone just loves him and his adventurous spirit so much. Jack Kaufman has been heli-skiing, with his brother, Don, of course. “We had no business being up there, but we did it anyway,” Jack Kaufman joked. Jack Kaufman takes at least one ski trip a year. He remembers trying to join an “over the hill” ski group for people 70 and older just weeks before his 70th birthday – he couldn’t wait. Jack Kaufman said he didn’t know about skiing as a kid. He and his brother would play the typical neighborhood-type games, like handball or touch football, but they weren’t particularly adventurous as children. “We grew up in the (Great) Depression,” Jack Kaufman said. Jack Kaufman’s son, Matthew Kaufman, remembers taking his father on an adventure he said he always wanted to try. Jack Kaufman was 78, and Matthew, who was 38 at the time, woke him up on a Saturday morning to take him skydiving. “And we did it,” Matthew Kaufman said. Jack Kaufman didn’t waste his time with a tandem jump, either – he took the class and jumped out of that airplane on his own. Matthew Kaufman started skiing when he was 3 years old. Skiing has become a way of life for him, and it’s all thanks to his dad, he said. “He’s just an amazing father,” Matthew Kaufman said. Jack Kaufman said he hasn’t really thought about giving up skiing, even at 90. He said his doctor doesn’t seem to be worried about him skiing at his age, either. After spending a life behind a camera lens as a professional photographer and a World War II combat photographer for the U.S. Airforce, his children aren’t surprised that he continues to live his life creatively. Whether it’s on a pair of skis or just cracking practical jokes with his family, Jack Kaufman continues to be full of life. “I feel lucky to be his son,” Matthew Kaufman said.